Experience the special joy of time with friends and family in a relaxed atmosphere. Everyone under one roof with multiple living areas and nine sleeping spaces. The luxury of privacy and the pleasure of fellowship. This is a casual, traditional, Charleston beach house. Check out our property on google sites for atlantichigh! Great family vacation home with less than 100 steps to the beach and no street to cross. 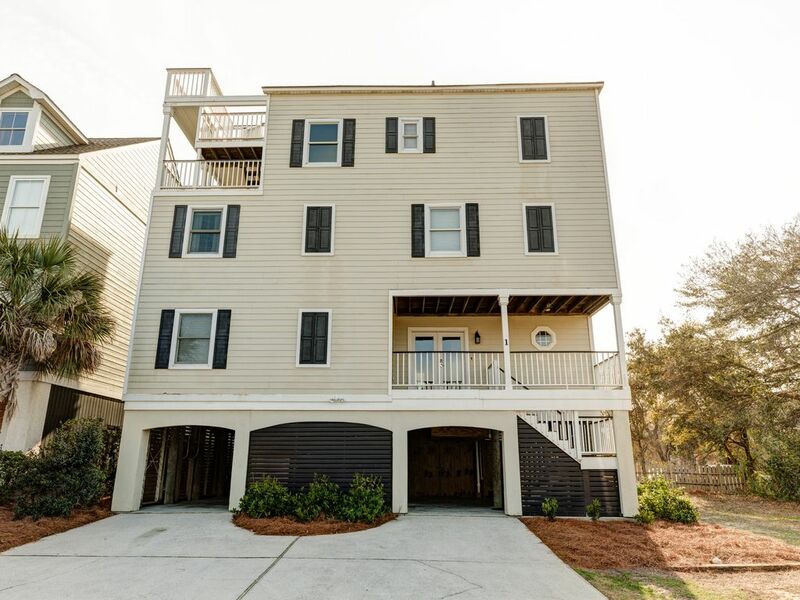 Experience South Carolina's southern charm in this great vacation home located in Wild Dunes, the premier resort community on the Isle of Palms. Enjoy the beach, the intra-coastal waterway, two championship golf courses. Wild Dunes Resort is approximately 20 miles from historic Charleston and the Charleston International Airport. Located on a quiet oceanside cul-de-sac in Wild Dunes, this home features a large well-equipped kitchen, with separate ice machine and extra large refrigerator! Four porches, all with breathtaking beach, ocean, and golf views! Dining room overlooks the Links Golf Course and the rooftop sun deck has great views of the ocean and golf course. This large home provides a great balance of open living areas and privacy with plenty of quiet spaces!! Six flat panel TVs; four with DVDs. Free WIFI serving only this home. During our prime season, we are a Saturday to Saturday rental. Prime season begins the Saturday before Memorial Day and ends the Saturday after Labor Day and also includes Christmas, Thanksgiving, and Easter weeks. The rest of the year, the minimum stay is 3 nights. Linens and cleaning included in price. No pets. No smoking. ACCESS TO LOTS OF SANDY BEACH! Our family has lived in many places, but always love coming back to Charleston. We designed and built this house for families and friends. We wanted space for privacy and lots of nice gathering spaces including many decks and porches. We love Charleston and the beach. Sunrises from the rooftop deck and just steps to the beach. Ocean views and links golf course views. We enjoy having multi-generational gatherings with Great Grandparents approaching centenarian age and newborn great grandchildren. We wanted spaces right for everyone. Most of all we wanted a casual beach house that people can really enjoy. We did not want it to be too formal or fancy, just fun. We enjoy having world class golf and tennis just outside the door. And don't forget the beach. South Carolina's only Blue Beach rated for cleanliness. Also some of the best restaurants in the world. And so much history in Charleston. Charleston is continually rated as the friendliest city in the United States. White hotel quality comforters with covers changed every week. Full access to 4 pools and other resort amenities. All pools are a mile away. Free transportation is provided through Wild Dunes to and from pools. Near the pools, you'll find shops & eating options. Separate Ice Machine, 5 porches and decks, 2 outside showers, dining seating for 20, roof top deck, views of the ocean and Links Golf Course. Two separate living areas on different floors. A separate Card/Game Room. We had a huge group stay here for our wedding and we loved it! It was gorgeous and so perfect to relax after our big day. Plenty of bathrooms, space, and we hung out on the decks most of the time spent here! Lauren was awesome, too. She was easy to get ahold of and really made our stay seamless. We would definitely stay here again! We are so glad you enjoyed your stay at our home! Hope to have you again soon! We had the pleasure of staying in this home for a large family reunion vacation - 10 adults and 6 kids. It provided ample bedrooms, bathrooms, and living spaces to accommodate everyone comfortably, and the kitchen in particular was very well stocked to accommodate such a large party. Instacart delivers groceries from the local Publix and there are a number of yummy restaurants that deliver as well. The beach was a very convenient walk away, and we really enjoyed the views off the top decks. The smaller kids loved searching for shells in the tide pools, and the older kids loved playing in the rougher surf. Also, sound carries in the home. Adults will be fine, but with two toddlers and a baby we definitely had a few unintentional early mornings. Overall it was a great experience, and I’m very thankful for the opportunity to have everyone in one home for the week. I would highly recommend this home for your next vacation!! It was very clean, had everything you could possibly need and was so spacious!! The owner was so nice and very easy to work with. The resort itself has so much to offer. We will definitely stay here again!! Our family has been staying at this home for years and love so much about it. We were blown away with the recent renovations that were done this year---making it even more of a luxurious getaway! This beach house is wonderful for large families or multiple families. We love the number of sleeping spaces, the user friendly kitchen, and the proximity to the beach. Our kids love the bunk beds, the showers under the house, and eating on the porches, especially the top deck! We have always enjoyed our stay and would definitely recommend it!